Stephen Amell posted a picture on social media that has sparked rumors about the cast of Smallville making an appearance in the Arrowverse "Elseworlds" crossover. The CW's big event is only a few weeks away, and DC fans are beginning to get pretty pumped, with a storyline that features alternate realities. We've already seen a Smallville tease with a picture of Tyler Hoechlin's Clark Kent and Elizabeth Tulloch's Lois Lane on the same Kent Farm that the original show used, but it looks like that may have only been the start. Arrow star Stephen Amell posted a picture of Tom Welling and Michael Rosenbaum, who played Clark Kent/Superman and Lex Luthor, respectively, on Smallville. The group appear to be tasting some wine together in a boardroom, but it's the caption that has fans excited. 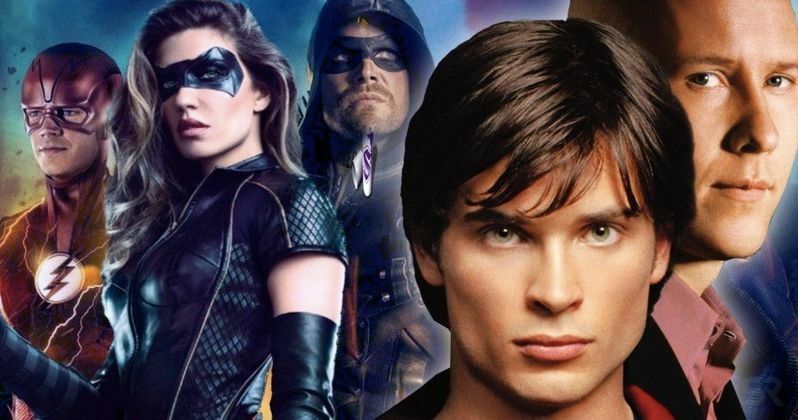 Amell simply says, "Pretty excited about this one..." Even though the shows don't take place in the same universe, it would be a cool nod to the older series with an Arrowverse "Elseworlds" cameo. The Smallville cameos in the Arrowverse "Elseworlds" crossover have yet to be confirmed, but with Stephen Amell's new picture and the original Kent Farm, it's beginning to look like things are coming together. Tom Welling and Michael Rosenbaum might not even be playing their original characters, like Dean Cain and Teri Hatcher, who played Clark Kent and Lois Lane in Lois & Clark: The New Adventures of Superman, when they appeared as different characters on Supergirl. Additionally, John Wesley Shipp, who starred as The Flash in the TV series from the '90s, is coming back to play the Scarlet Speedster. Shipp currently plays Barry Allen's father in the current CW version of The Flash. Smallville ran for a total of 10 seasons, from 2001 to 2011. The hit series started on the WB network and then moved over to the CW in 2006. The first four seasons focus on Clark Kent and his high school experiences. After Smallville Season 5, the show went into Kent's adult life, eventually focusing on his career at the Daily Planet and introducing other DC superheroes and villains. The show was well-received and Superman star Christopher Reeve gave his approval of the show as well. The Arrowverse's "Elseworlds" event starts off with The Flash on Sunday, December 9th at 8PM and continues with Arrow on Monday December 10th at 8PM. The crossover event then concludes with Supergirl on Tuesday December 11th at 8PM. DC fans are already excited for what the multiverse crossover event will bring, but the addition of a Smallville cameo is almost too much. Now it's time to start really wondering about a Batman cameo, especially since it seems that nearly everybody is going to be included in the event. You can check out the picture of Tom Welling and Michael Rosenbaum below, provided by Stephen Amell's Twitter account.